Ok, you got a better song with Boom in the lyrics? Today it was time to pull out the old mast segment we’ve had squirreled away and start creating the main boom. 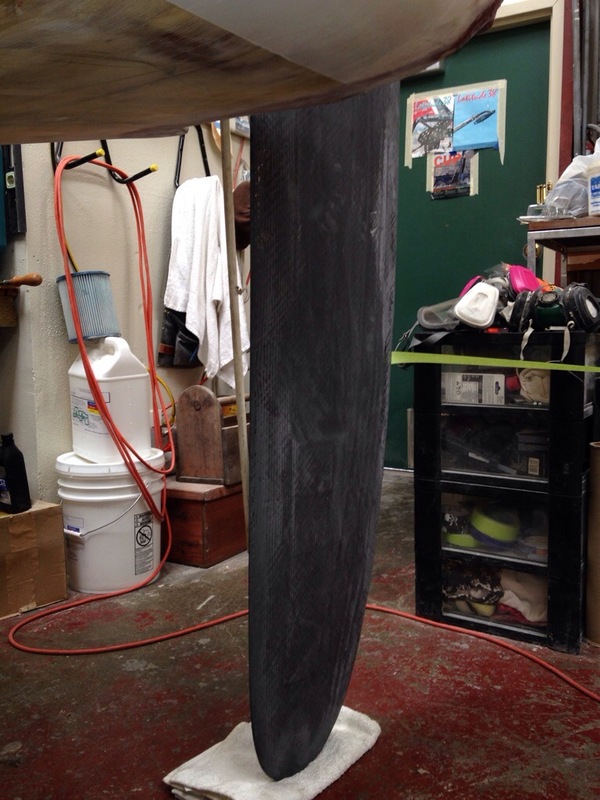 This stick is 18′ of a salvaged carbon mast. The section may be overkill but if we leave it as is, it should be a hell of a strong boom. One option is to cut away the last three inches off the skinny side and form a new, much lighter lower edge the whole length. Or we take Mike Leneman’s simple suggestion of making Swiss cheese holes all along the boom. 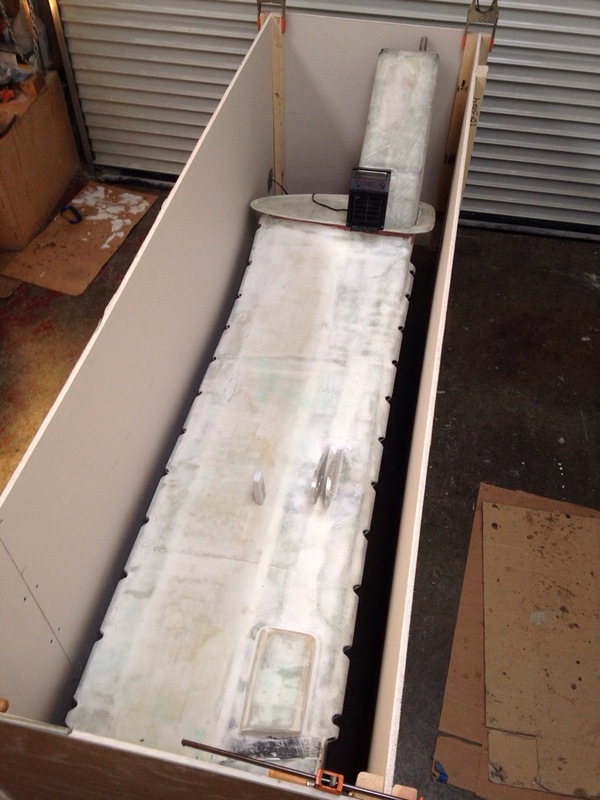 That would also save weight and make it easy to run reefing rigging internally. And we also need to think through making sail catchers that stick out about a foot on both sides of the boom. 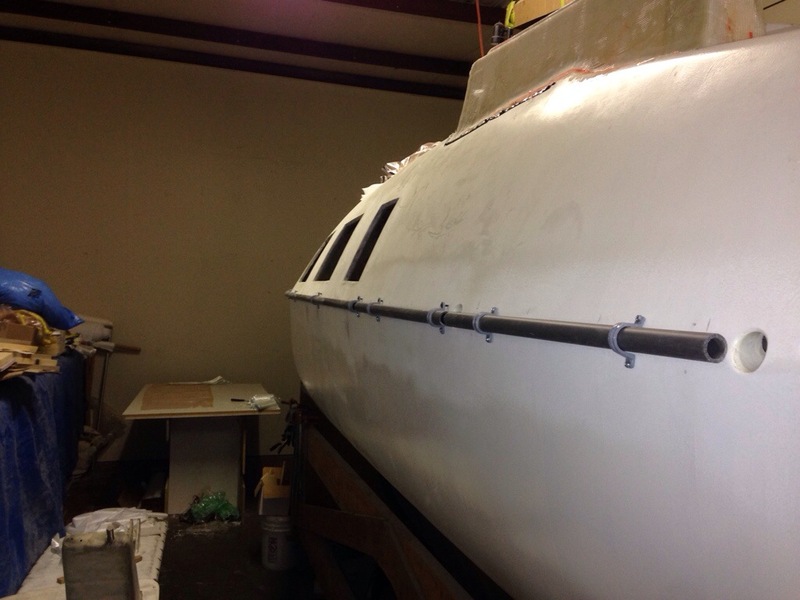 We started making a forward end bracket to bolt inside this boom, which will provide a strong pivot pin attachment to the gooseneck on the mast. 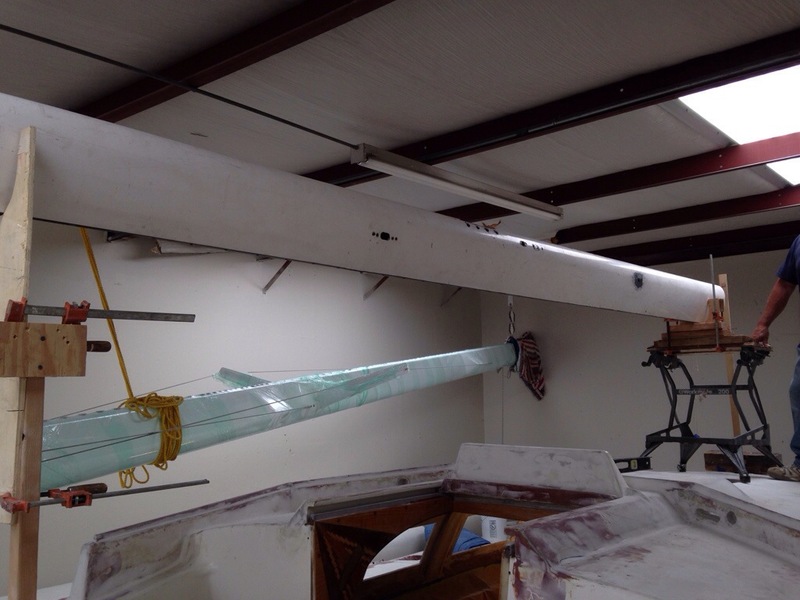 One big bummer is that goose is already bedded and bolted to the mast at 54″ up (for the Shuttleworth it was commissioned to) but we need it a foot lower (that would get it to the level resting position seen in these sawhorse holding photos). 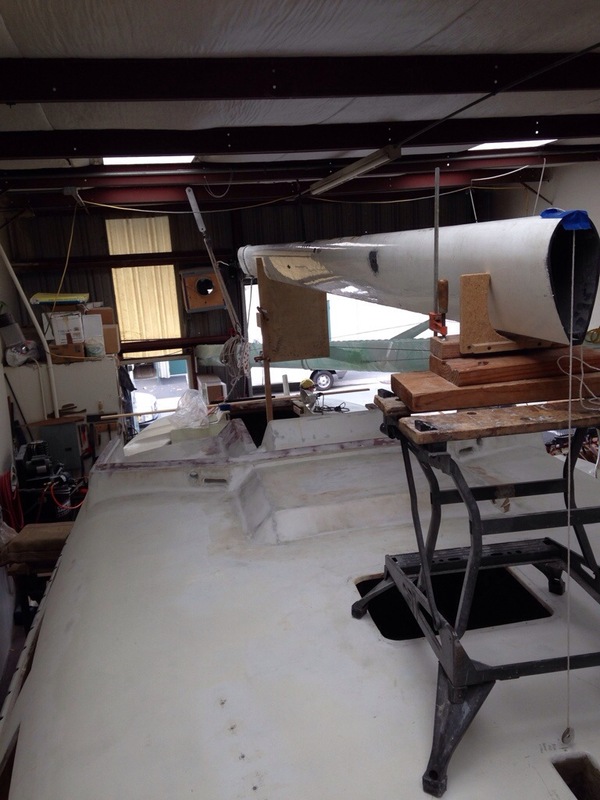 Can’t really do that mast work until the boat is out of the workshop. Hmmm. The next update should have that boom end bracket to show you. And yes, the boom in this position shown is 6’3″ above the cockpit floor so fewer whacked heads expected. It’ll be about a foot above the hard top, leaving room for some solar panels up there. 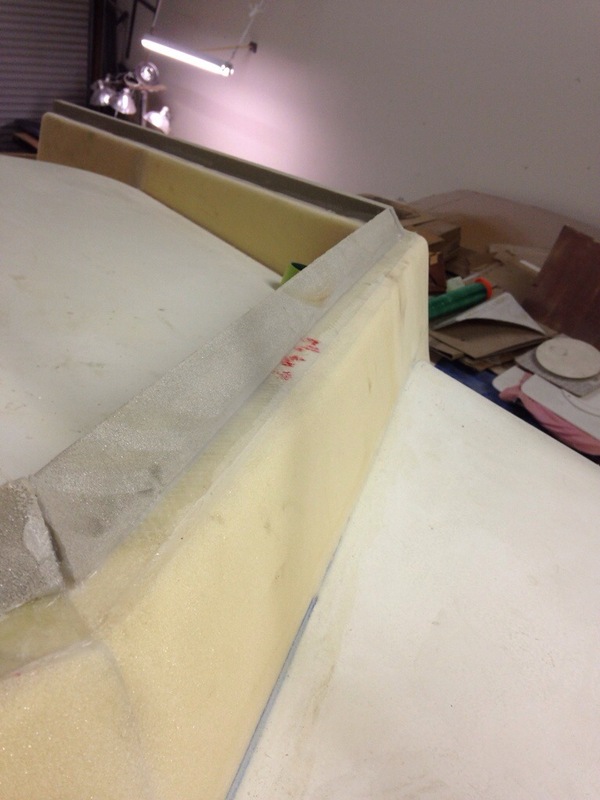 The yellow strip is a Kevlar piece to help make the leading edge tougher against hitting small stuff in the water. 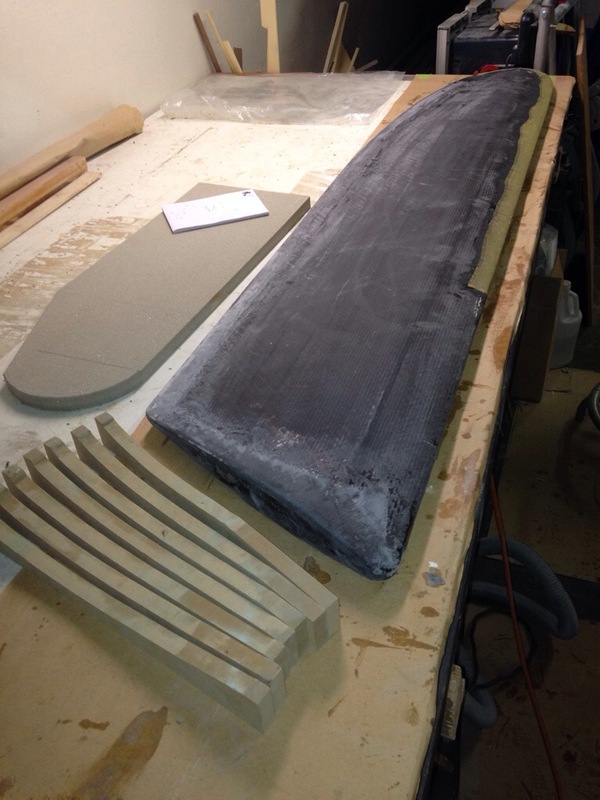 I’ll do a bit more final fairing on this board over the next couple of days and then it will be time to make the scary cut into it to creat the trailing edge trim tab. Cover your eyes, Mertyl, this one’s not for the faint of heart. 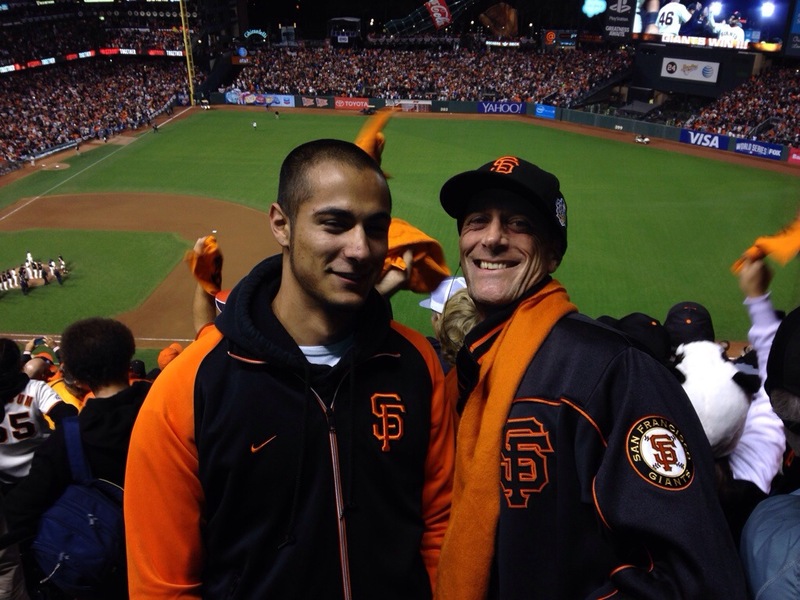 The boat has suffered some October down time due to excessive viewership of the SF Giants run. The prudent move would have been to purchase 10 gallons of epoxy, but instead the $ went to tix for Bumgarner’s shutout on Sunday. It’s warmed by a simple incandescent 60 watt bulb under an aluminum plate holding up the bottles. Good things are happening building out the aft cabin furniture. Photos to come once the bunks are bonded in. 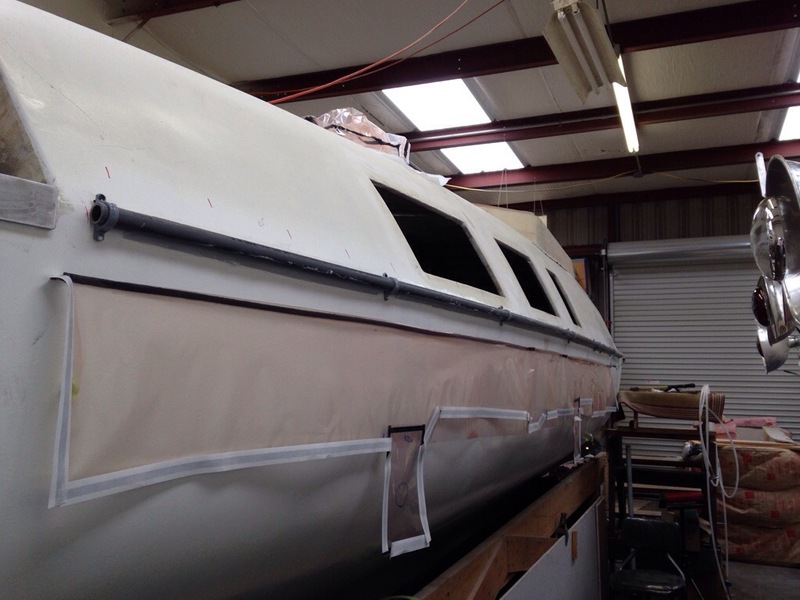 Yes, doing some work on the inside even though I said no cabin work until all exterior parts are complete. Thankfully it means we’re getting to the end of the outside stuff and can see the light towards the winter interior build. 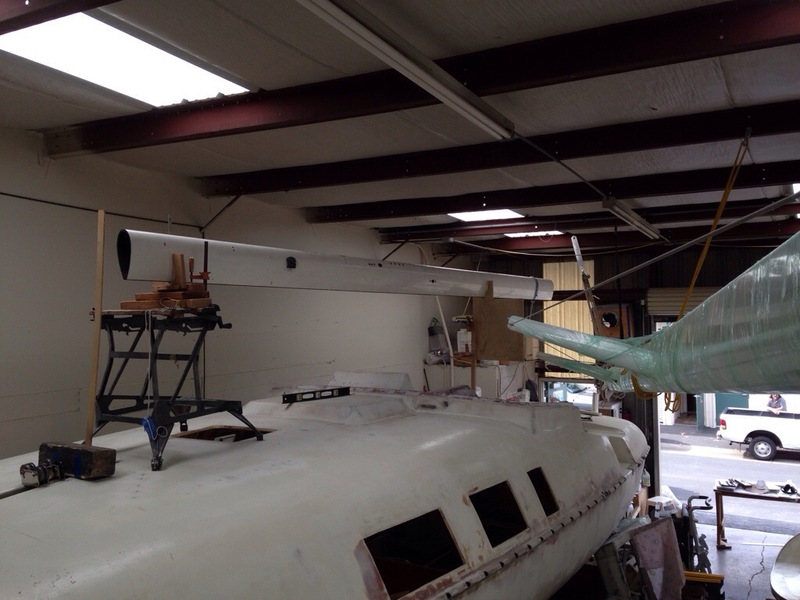 We’ll skip the Giants parade and work on the rudder! This week I think we’ve finally gotten in the groove, so in case anyone reading this stuff is just starting out, maybe these musings can help reduce some error in your trials? 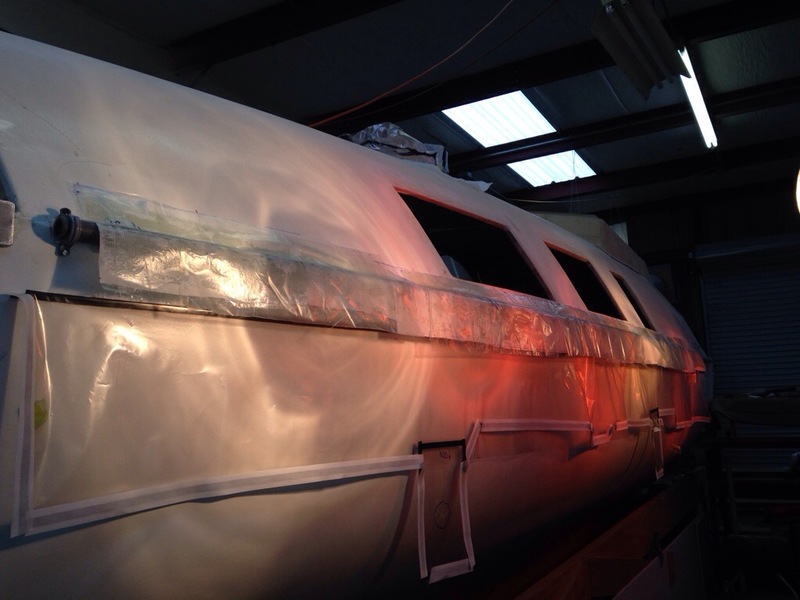 That’s the second of four stages vacuum laminating the net lashing tubes to the hull’s port side. Significant only because it’s the first success using a splitter to draw vacuum on two separate projects in one pump run. A small moral victory around here. Stage 3 was the 15 foot section between the main beams. Here are the steps. Took measurements between the temporary straps, and cut all materials to leave an inch and a half on both sides of the straps so epoxy wouldn’t migrate over the straps. 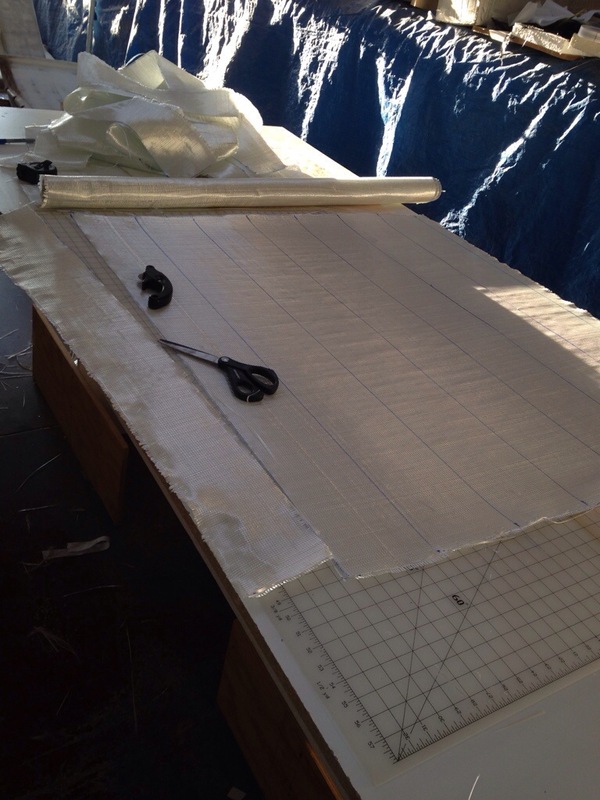 Built the bag down on the 8′ work table where it can be stretched snugly and the sticky goo tape applied, leaving the paper backing in place. Setting up the tape in this calm manner, before any epoxy is mixed, took me too long to realize! Planned for add-on patches to make out-of-the-way zones in the bag for the pump fittings to sit. 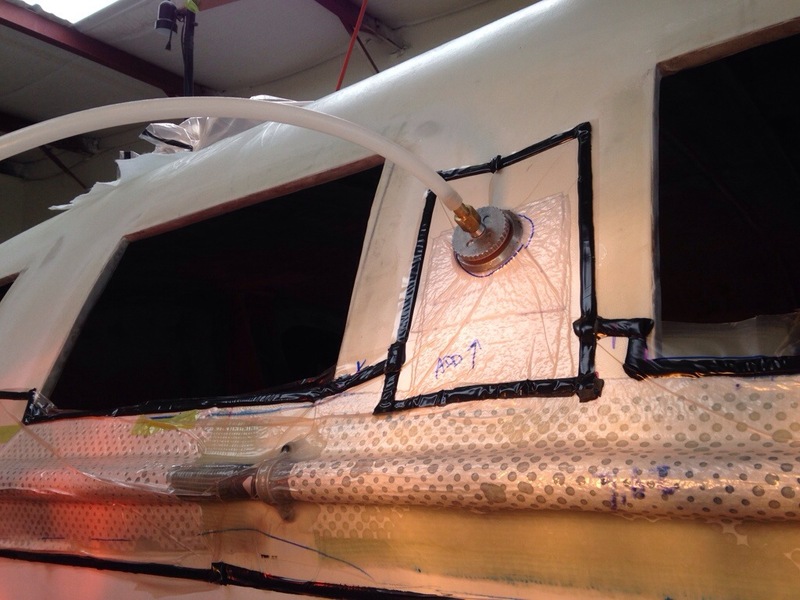 Leaving at least six inches between the air connection and any live epoxy work, linked by plenty of breather fabric, keeps the glue away from the pump’s tubes and fittings. (Learned after a nasty hour of scraping out glue-fouled bag fittings one night – these parts aren’t a quick Home Depot replacement). After cutting fglass fabric to the six inch width for this job, the ‘bagging’ supplies were cut: peel ply at 7 inches because a bit of overlap makes it MUCH easier to remove later, release film at 6″ because any more would be waste, breather fluff at 5.5″ because when it goes all the way to the edges it invariably ends up adhered where you don’t want it, like on the hull!, and the bag film itself at 11″ – leaving 2-3″ past the edge of fiberglass is minimum. For this vertical work I needed the bag to help hold the wet materials in place before the pump turned on, so I cut it close and snug on purpose. 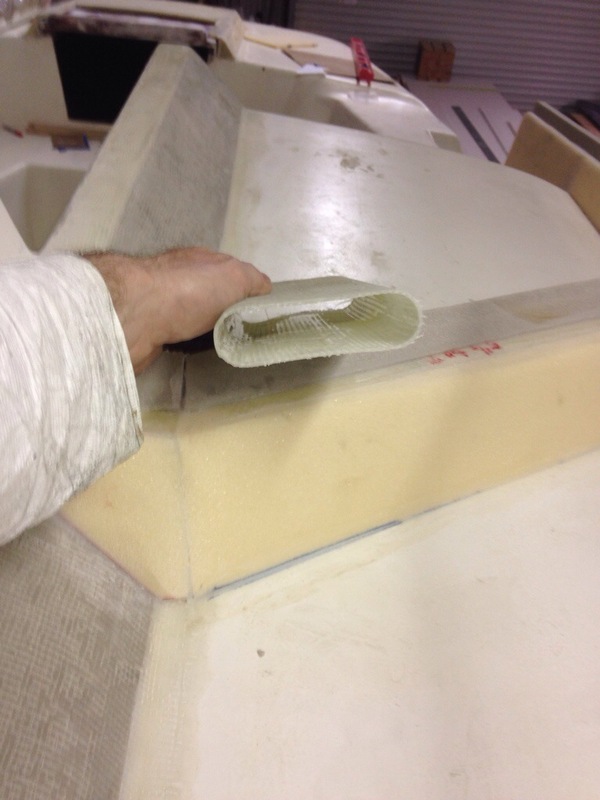 With materials all ready, it was time to apply the putty fillet around the pipe, and let it harden up a bit, but still pliable for the bag to press the fiberglass into the fillet and be able to take by-hand smoothing from the outside of the vac bag. Here’s the bag in place, but folded down out of the way. Then the fglass was wetted out on the table and rolled up like little pillsbury crescent rolls (sans hot dogs, Mom) and walked over to the boat after sitting under warming lights for about 20 mins to get tacky (sticky). Here that is with peel ply to help hold it up. Note that it won’t adhere yet to the underside – gravity wins. 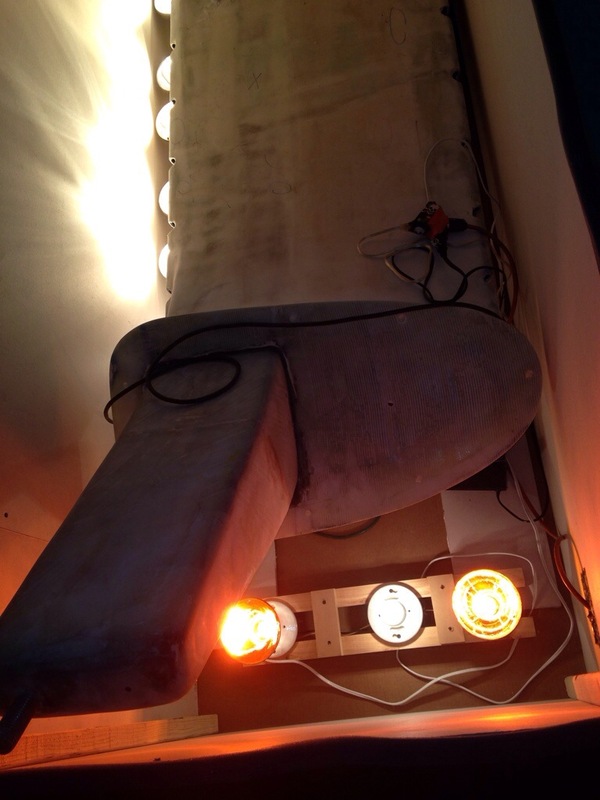 The heat lamps are going because there is a putty fillet above and below the pipe, trying to time it so that is just hardening when the vacuum is applied. Too early and it will squish out; too late and there will be ugly lumps in your cream of wheat. Next shot is after applying release film and breather fluff, some of which needed dabs of masking tape to hold in place. Bag was then brought up over the work taking care to tuck things in flatly. With this long, complicated bag, there were some air leaks but they were solved in a few minutes by pressing the tape all over again and adding a few inches of backup here and there. Having these separated tube attachment areas has helped quite a bit, compared to earlier work where I didn’t plan out the connection spots. Cut the bag to fit the work, and simply add a big ‘patch’ as needed. All in all, no drama today and it all came out with nice, uniform tubes that need only minor fairing work. In retrospect, I probably did this all backwards; someone could try small 2-3″ fiberglass strips next to the pipe straps first. Then remove the straps after the glass strips dry, and you could probably do the whole project in fewer bagging sessions. Just a thought. And as Jeanne’s Mom always said when preparing the fruit for canning, “I found the one we’re looking for – the last one”…. Here’s beam number four escaping the oven. Don’t ask about the electric bill. 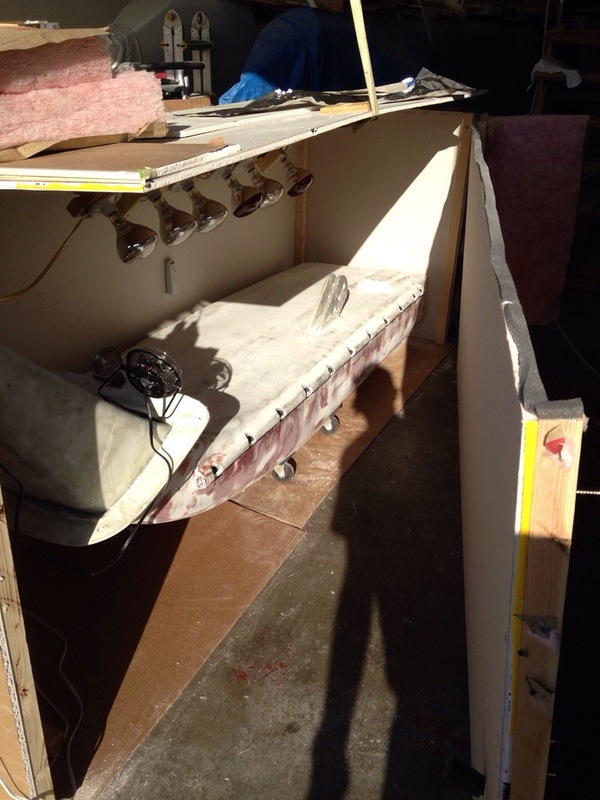 This big box is REALLY in the way, but it will stay up another day or so to bake the rudder after the last fairing work. 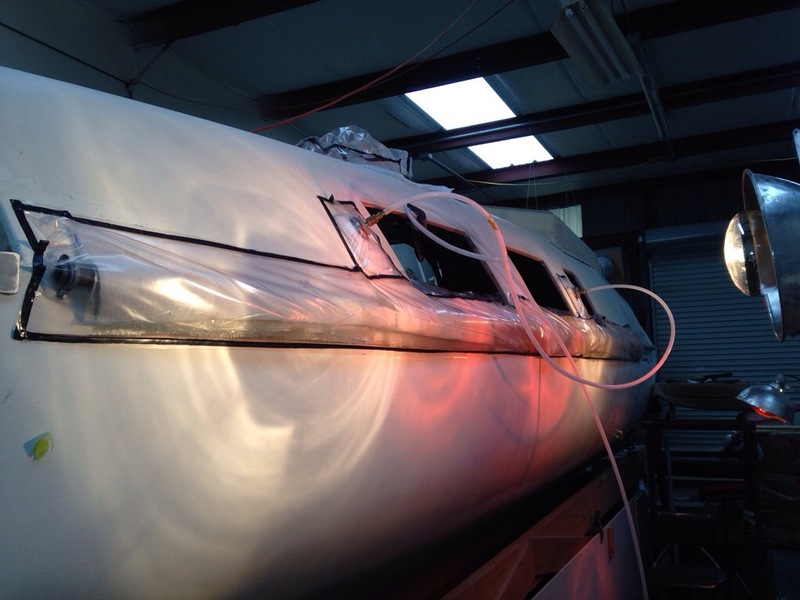 Getting excited to start on the rudder’s cassette steering assembly! It’s actually hard to find a remote-sensing thermometer that will read warmer than your average bad day in Death Valley. 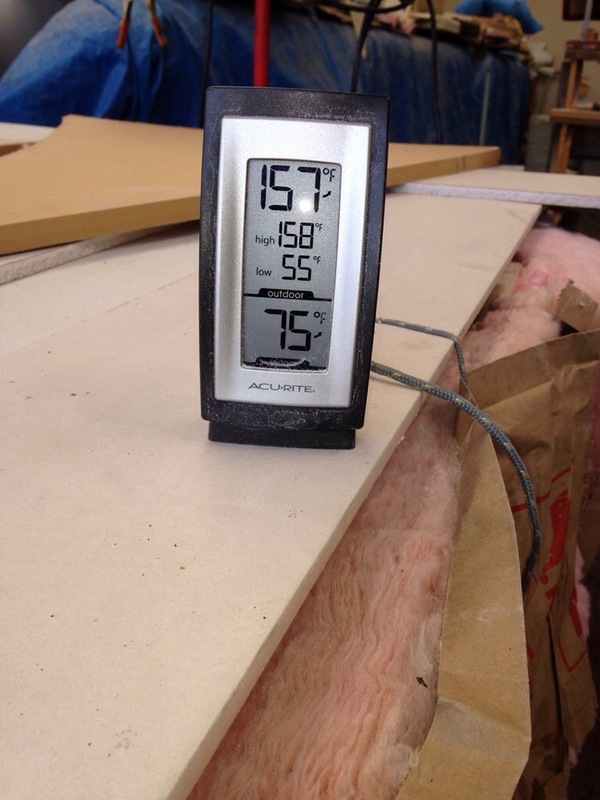 This one from Home Depot tops out at 158 degrees, which works for our 160 target. The ‘oven’ has a removable section of Sheetrock to reach the power switch and read the old fashioned meat-cooking thermo inside to make sure we don’t get a runaway thermal event past 175 degrees or so. This combination does the trick. We also had to hard-wire some temporary plugs, conduit and switches because regular power strips couldn’t take the heat or current draw. Also needed to find a replacement air circulation fan after smashing Colin’s nice little unit with a little slip – oops. The fan is a must with a box this big – think of how convection ovens have hit the home improvement market. Too many trips to the hardware store and wasted time on various improvements, but this post-curing system is now a-ok. Beam #2 was cured on Sunday, and the other two will fire early this week. 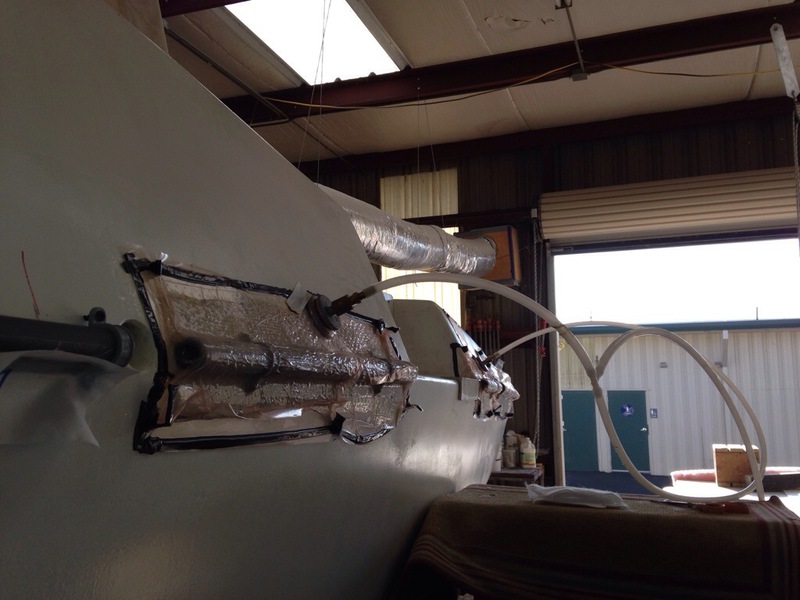 We’ll laminate the fiberglass in sections, skipping the spots where the pipe straps sit. Once the primary bagging is done, we can hand-patch the little spots left in between. The straps are held with tiny 1/2″ screws, in just enough to bite. Those little holes will get putty filled before we proceed to seal everything up. Sunday afternoon was spent preparing the 186′ of six-inch wide 18oz fglass fabric needed to create these lashing anchors. 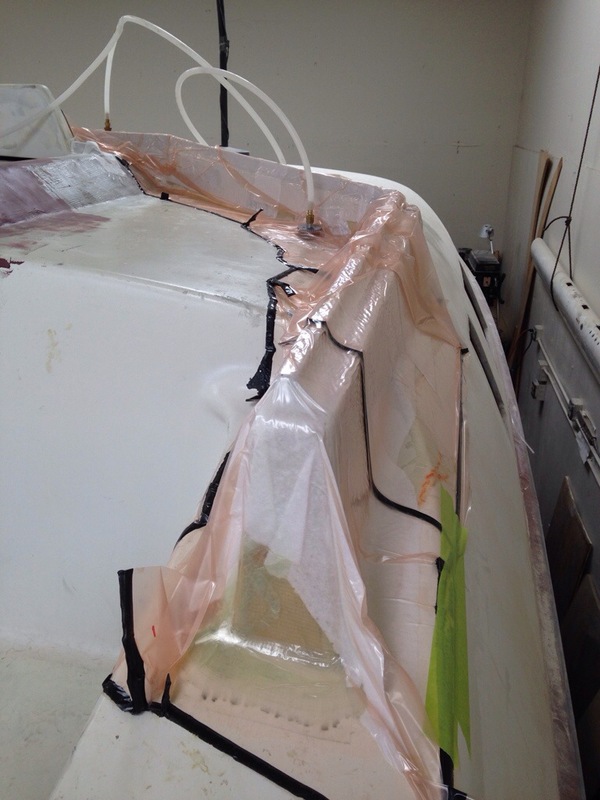 That’s 31′ along the hull x three layers x port/starboard, plus all the vac bagging materials. After ten minutes of scissor-burning wrist work, it was a run back home to grab Jeanne’s fabric cutting board and rotary cutting wheel. That helped a bunch, and it was returned in time for tomorrow’s prom dress sewing. 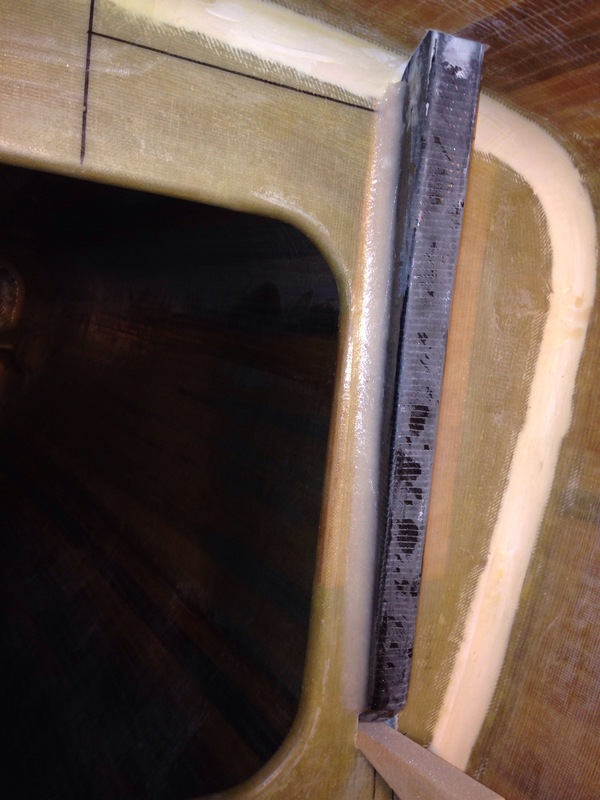 Rudder fairing is good – first side finished today, and we attempt to get the exact match with side two starting tomorrow. Just keeping things fair, man! Well, the oven run from the last update got to about 115. So we upped the heat bulb count to 4 x 250 watt plus 5 x 125 for 1600+ watts to heat an 85 cubic foot box. Also added some R13 attic insulation around the box and a small circulation fan inside. With the afternoon sun beating down on the works, we hit and held 160 today, so beam #1 is officially post-cured. Just need three more warm sunny schedule free afternoons. 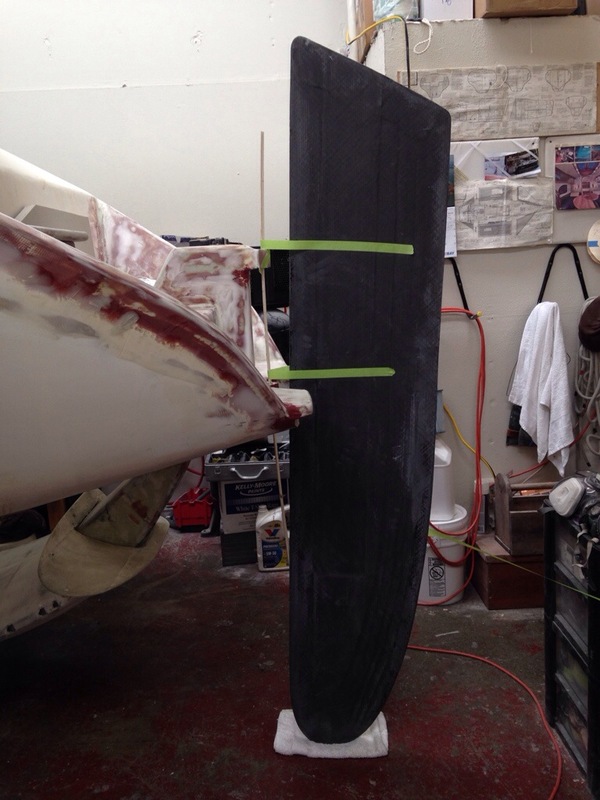 Started fairing the rudder and it looks way better quickly. 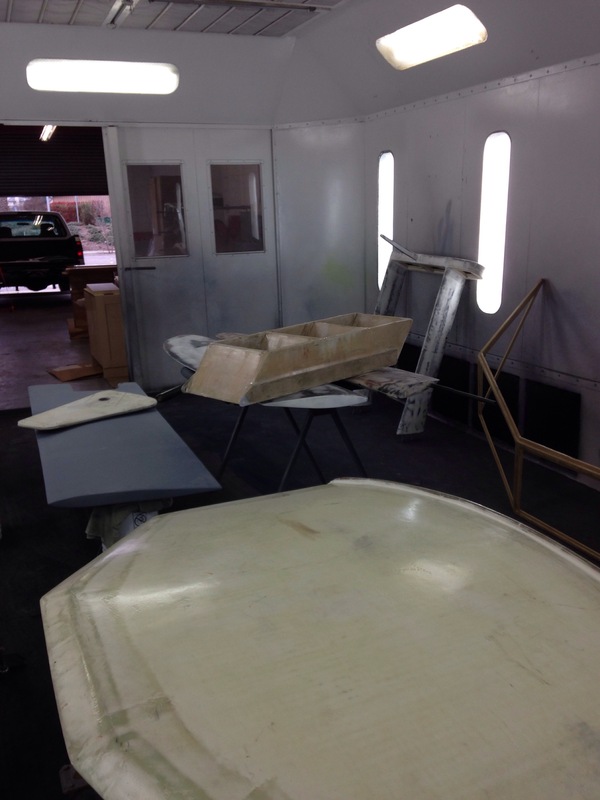 Photos will come once the fairing is done and we’re in primer. Really need to get this done so the steering components can begin. For those following Fram’s build, with all Henny’s amazing engineering steps, you will see the polar opposite develop here. Simple, crude and hopefully just as effective as the great feeling of steering the F27. Back to the windshield, the rope pass-thrus came out quite smartly. 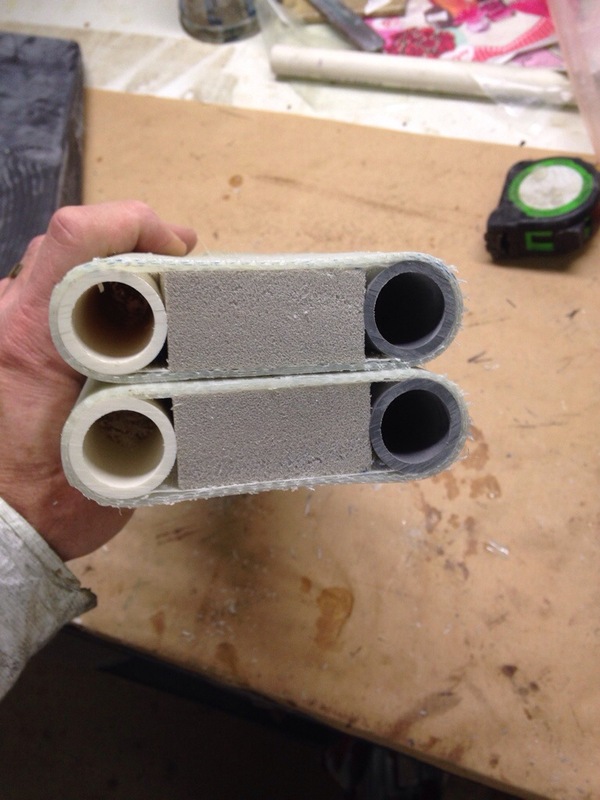 Here they are being cemented in place yesterday, and were cut off flush this morning. Next the center portion and the port side got 16oz glass and an awkward-shaped vacuum bag. Attach all the sticky tape in advance to one side of the bag material, doing that work flat on your big table. Things like adding the sticky tape on one end after the glass application totally screwed things up. Work a trial run with everything dry and plan out where extra baggy material is need to conform to staggered / stair step shapes. Otherwise it’s really frustrating to have a whole bagging set up but one big corner gets stretched to the point where there is no actual downward pressure on an inside curve or corner. This stuff sounds easy but it seems a real experienced art form to me. Tricky to get it right and I keep learning to make the bags bigger, although my inner tight-wad pushes back on materials (perceived) waste. Let’s see if tomorrow night’s port side windshield frame gets done more smoothly than today’s. Yea! The rudder is complete and it’s very exciting to have this vital part of the boat here on the table instead of the plan diagrams not too many days ago. 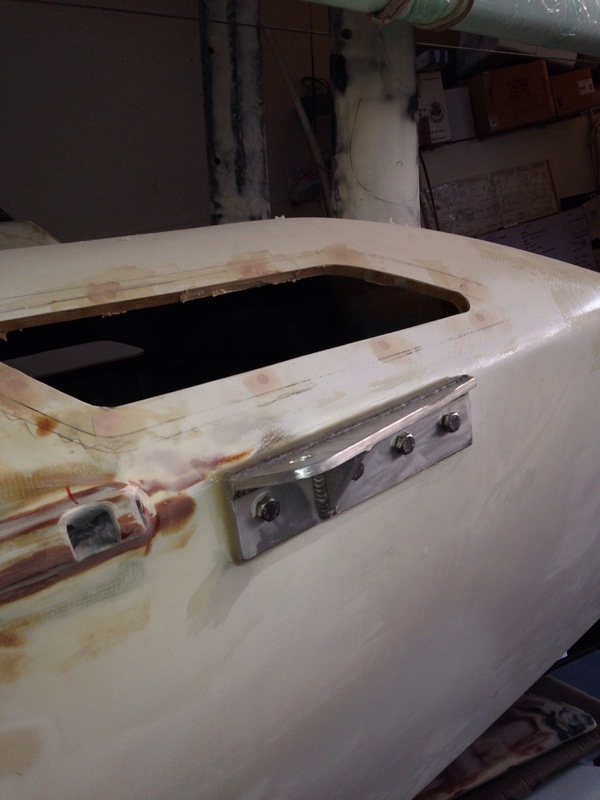 The last touch today was to wrap the leading edge in Kevlar – not in the plans but we decided that about 12 more ounces of weight to put a bullet proof vest-like protection on the front where crap hits a rudder seemed like a smart trade off. It’s the remnant fabric from the full hull length keel-line protective strip that went on the main hull 15 yrs ago. 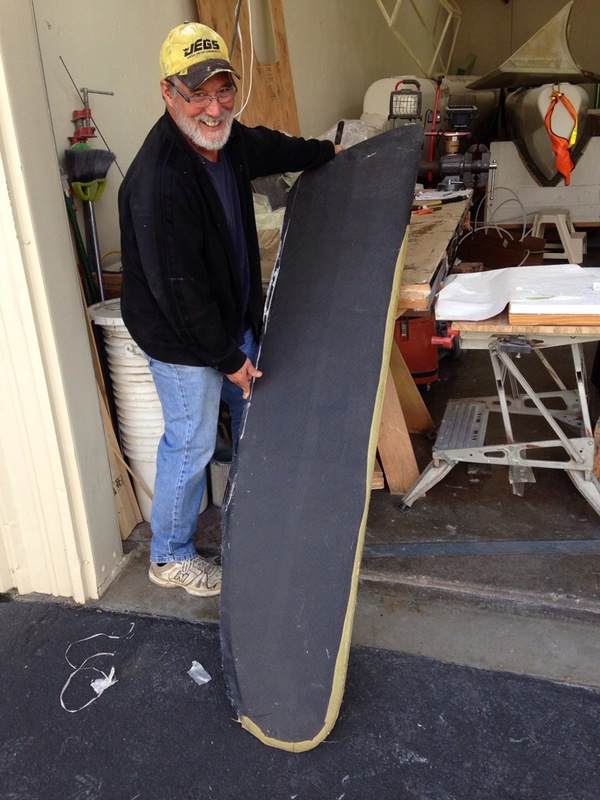 And that foam blank to the left is another rudder to build – for Colin’s rehab Coronado 15 project. 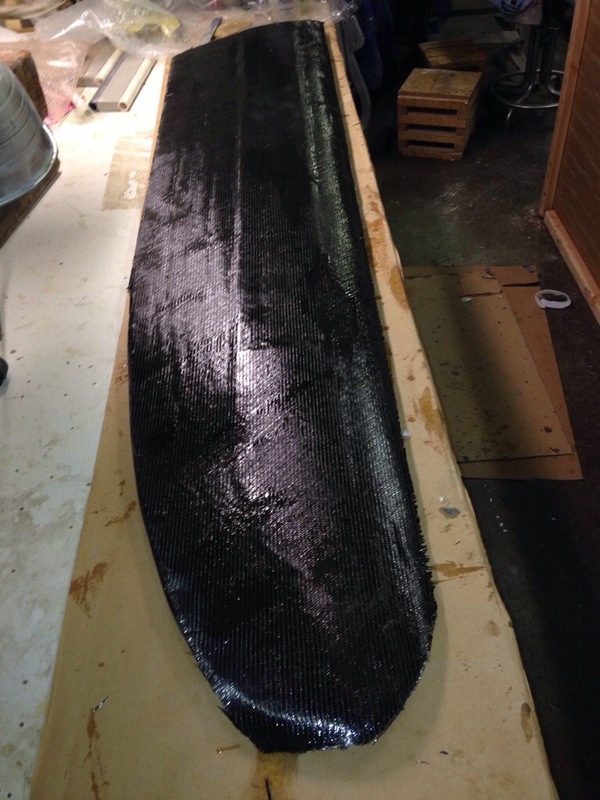 Figured we might as well do an airfoil shape too. Stood the rudder up in position so you can see the difference from the similar shot of the foam cutout a couple weeks back. Makes more sense now! 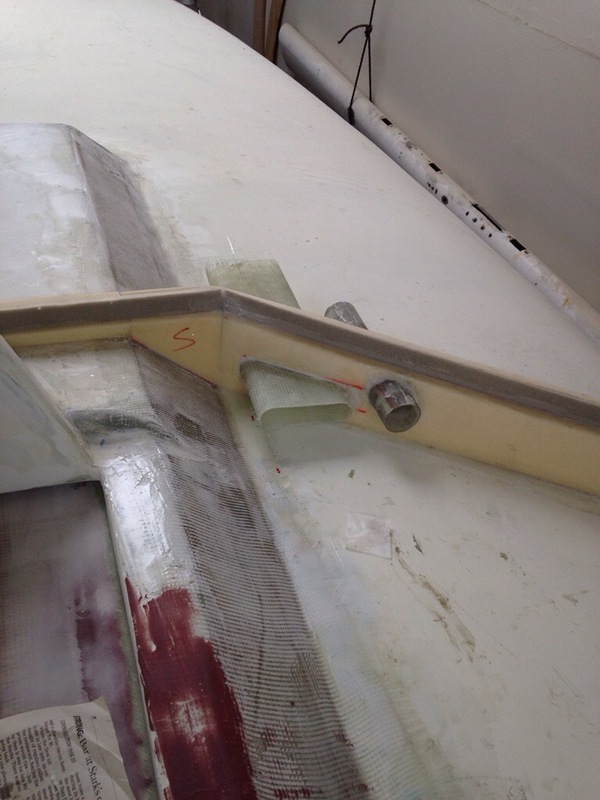 In that last shot, see that the rudder will actually drop another 8 inches or so once the floor isn’t in the way. Writing this tonight while trying not to stare at the curing oven thermometer. Space heaters didn’t work, and like others I’m on to trying heat lamps. Got to 115F with about 600 watts of lamps. Added another 540 watts tonight and we’re passing thru 105 as I type. 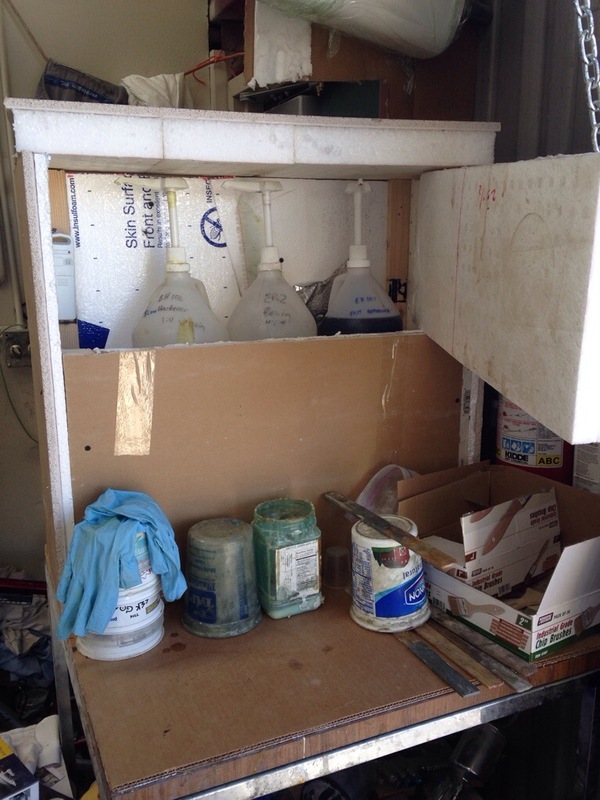 The Applied Poleramic folks want their ER2 to post cure at 160 for two hours. They told me by phone that I could substitute some time for heat, like maybe 140 for four hours or so. 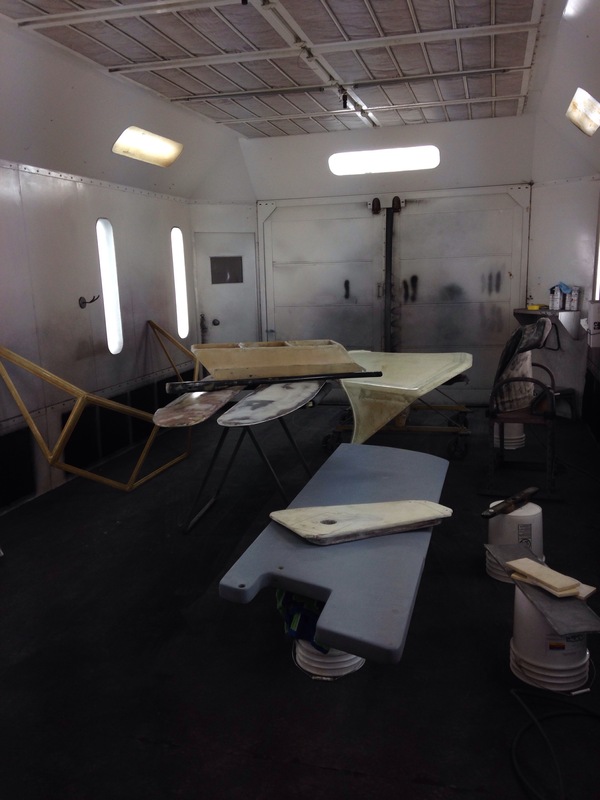 If we don’t get far enough the shop neighbor has a friend at the car painter – we could haul all the beams, the rudder and other structural stuff over there for an evening bake off. Guessing he’d charge a few hundred and it’s a big pain in the rear to transport this stuff. Tonight’s red lamps should look quite familiar to Mom – remember keeping all your dogs warm in the shed on the freezing Sonoma nights? 107 and still rising. Time to go cut out glass fabric for the windshield frame.